One less Reaper to worry about at Firebase Vancouver. The never-ending battle for all creation rages in the Mass Effect multiplayer universe. Now, thanks to Bioware’s latest downloadable content, players can take the fight against the Reapers to a new theater of war: the planet Earth. Released this past Tuesday, “Mass Effect 3: Earth” adds a slew of original game content to an already massive video game experience. 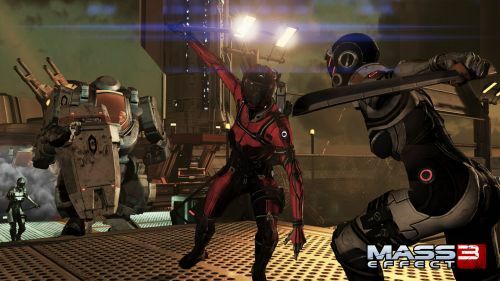 The pack includes 6 unique N7-based characters, three new weapons, new gun modifications, and the long-awaited debut of the grueling Platinum difficulty level. This digital supply cache of sorts continues Bioware’s tradition of re-invigorating older titles by infusing extensive and galvanic game expansions. 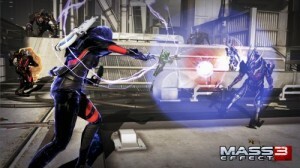 And considering the solid competition from other retail online shooters, Mass Effect’s “Earth” DLC accomplishes a very important goal for BioWare and its parent company EA Games: it breathes new life into an often repetitive but popular online experience that lives or dies by high levels of community interest. With the new additions, gamers enlist some of the planet’s finest military warriors: the N7 Special Operations officers. These highly-trained fighters are the best the Alliance Navy has to offer, evident by the type of skills and tactics they utilize while deployed on firebase missions. For example, players who want to overwhelm their enemies with unadulterated firepower while sporting maximum damage protection can now use the N7 Destroyer, a soldier build that instantly reminds one of the Marvel Comics character War Machine, minus the ability to fly. The combination of a devastating, carpet bomb-like Multi-Frag Grenade attack and shoulder-mounted Missile Launcher (it’s not as powerful as the Cobras you get in the store’s equipment packs but it still packs a punch) makes this tank-like dynamo a deadly warfighter to take into battle – and an enjoyable means to let off some steam after a long day at the office. The N7 Demolisher, the newest member of the Engineer class, features a ground-breaking power concept for people who hate jumping out of cover to restock their ammunition: the Supply Crate. This mobile station features timed re-supplies of thermal clips and grenades, an option to buff player weapon or power attacks, and frequent re-charges of drained shield barriers. Use this station to satisfy ammo-hungry competitors who fight over fresh provisions at the in-map ammo boxes. The sword-wielding N7 Shadow. Phantoms will never know what hit them. If your gameplay style favors subtlety over mass destruction, then the N7 Shadow, the Alliance Navy’s answer to Cerberus’ Phantom class, makes for a great selection for multiplayer matches. This sword-wielding assassin blends the class standard Tactical Cloak power with the all-new Shadow Strike attack (a trick only used before by master thief Kasumi Goto in Mass Effect 2) and the Shockwave-like Electrical Slash to form a very powerful and illusive infiltrator build. Spec this character correctly and players will have the ability to take out just about any target with one Shadow Strike on Gold difficulty. Along with the arriving reinforcements, “Earth” unveils three new battlefields where players can unleash hell on the enemy. With Firebase Vancouver, gamers fight through the war-torn corridors of a major downtown hospital, a locale which provides a range of spots to use as cover or to stage ambushes of unsuspecting foes. At Firebase Rio, a single elevated control platform serves as a strong tactical stage from which squads can engage enemies as they drop in from all directions onto this floating N7 facility. And players can re-live the final moments of the single player campaign at Firebase London, a fact simile of the city’s razed and ravaged urban neighborhoods featured in the last missions of the game. 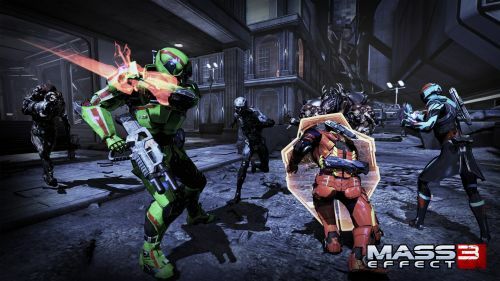 The N7 Destroyer (l.), N7 Paladin (c.) and the N7 Slayer Vanguard (r.) bulldoze through a group of Husks. On top of all of these new pieces, which also includes new firearms like the Piranha automatic shotgun, the Typhoon assault rifle and the Asari Acolyte pistol, the “Earth” DLC debuts the immensely challenging Platinum matchmaking difficulty. With this new option yields greater operation credit rewards and a substantial amount of experience points, but also boasts more powerful enemies in much larger numbers than those found in other difficulty levels. Platinum mode also showcases a twist worthy of the drama-filled franchise: participants can select their enemy race at the beginning of the match as normal. But, as the waves progress, random opposition force classes from other factions enter the match as well. Basically, you may face a platoon of juiced up Geth Primes flanked by speedier Banshees or see a squad of nearly indestructible Atlases marching side by side with herds of animalistic Brutes. It’s not a proposition for the faint of heart or those deficient of proper gear loadouts. In fact, game developers admitted that few at BioWare’s home offices ever completed the mode. So if you plan to tackle Platinum, be warned: you will die often but you may also win a few in the end. All in all, BioWare’s “Earth” DLC adds breadth to an already sprawling gaming structure, a greater variety of ways to subvert the enemy and most importantly, shoots a booster shot of content into an already fun social experience. And considering that the upgrade pack is completely free, there really is nothing to lose by getting it – other than some hard drive space and all those Strength Enhancers collecting digital dust in your consumables inventory.